Dartmouth Row is 15 minutes walk from the Triangle, across the A2 at the top of Blackheath Hill. The quality of books is very high and the prices are astonishingly affordable. There is a wide variety of bargains to be found, from second-hand paperbacks to review copies of recently published novels. 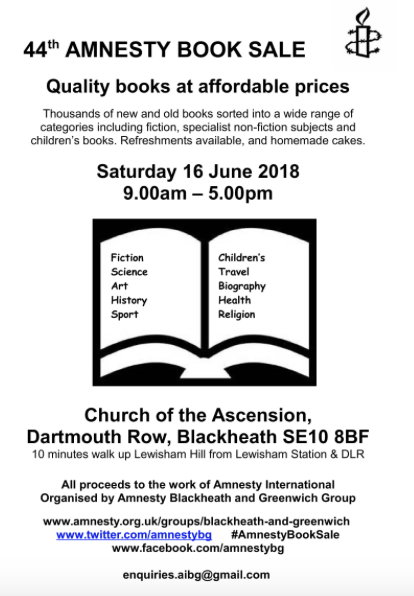 The group’s book sale is Amnesty International’s most successful local fundraising event in the UK, raising £300,000 across the years. The book sale is also a campaign event so people can both buy books as well as sign petitions for the group's campaigns.